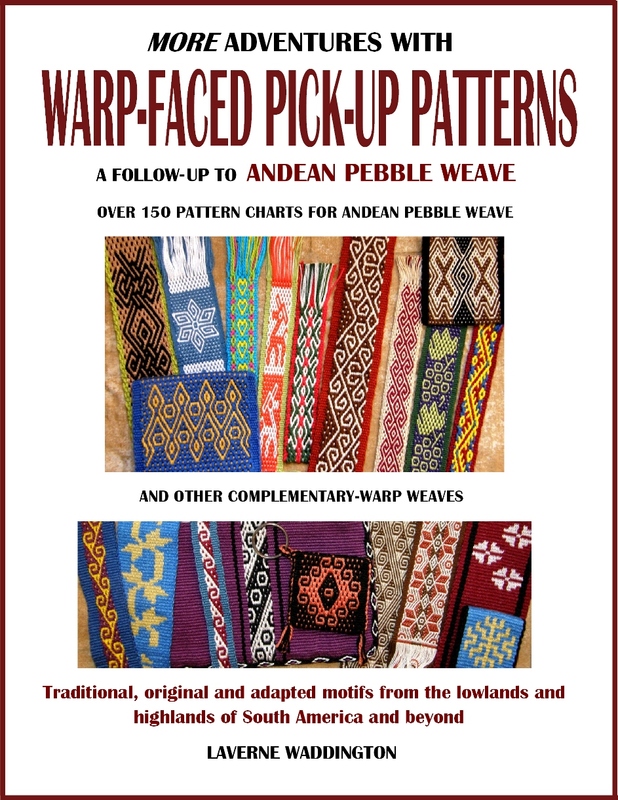 My friend Dorinda in Cochabamba wrote to tell me that my annual order of woven bands from the weaving co-op has been mailed to me….exciting! I only just managed to get myself a new P.O Box in time for this delivery. The timing is nice for the weavers as well, as money from this order will help mothers with the purchase of items on that long list of school supplies for the new school year that recently started. Pictures courtesy of Dorinda Dutcher PAZA Bolivia. Here are Maxima and other weavers in the cooperative thinking about color order and preparing to wind a warp for one of the bands. Maxima’s warping partner sits at the opposite end of the frame. The balls of yarn will be rolled back and forth between these two ladies. After installing the shed rod and heddles, the warp will be transferred to the traditional leaning vertical loom. Dorinda’s posts are always fascinating. 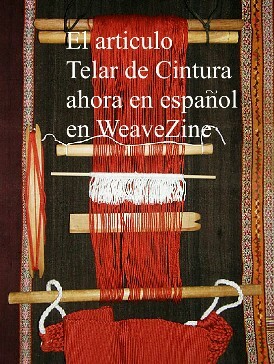 Please, head to her site for more stories about her weaver friends and the work they do. I took the opportunity when I caught Dorinda online to ask her about the decorative sewing that Maxima uses to join the panels for her carrying cloths, or awayos. I was wondering if weavers in Cochabamba use the same name for the joins as that used in northern Potosi…siray. Maxima gave Dorinda the Spanish word costura which simply means seam. After I expressed my surprise at the fact that Maxima wasn’t using a word in her mother tongue of Quechua, Dorinda asked again and was told siray. Maxima had simply translated it to Spanish knowing that Dorinda wouldn’t understand the Quechua word. 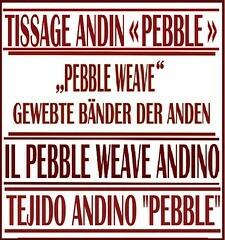 However, Maxima doesn’t have different names for the different kinds of stitches, unlike the weavers in northern Potosi. Here are a couple of decorative siray on two new awayos that Maxima wove. This first piece shows patterning in warp-faced double weave. Having warp stripes at the edge of the cloth is a wonderful way to help guide the placement of the stitches and I plan to include stripes like this in my next wool piece. Just eye-balling the spacing is really hard! However, it doesn’t seem like Maxima places that much importance on having all the shapes in alignment. I like the sort of free spirit the work shows. She changes thread color when she runs out and is not concerned about only doing so at the start of a new shape or about having an equal number of triangles in each color. I am sure that there is little or no embroidery thread wasted that way. I am about to wind the warp for my next set of wool panels and must remember to include those stripes. I wrote a couple of weeks ago that I was planning on winding that warp very soon. I had mapped out the colors and chosen my patterns. Luckily I didn’t go ahead with it as that was Version 1. I have since moved on to Version 4 and am still not quite sure that I have it right. I have all the time in the world to ponder that as my yellow scarf is now off the loom and I am not weaving. However, my sticks are calling out for a new project. Here’s the scarf still on the loom with various tools that I used to create it….two shuttles: one for the main yellow weft and one for the cream supplemental weft, one of the two long swords that I used, a pick-up stick for the flower patterns and a small sword for extra beating in certain spots. Because I wove this in plain weave, I also used a coil rod. It was an 86” warp but I stopped at 65” of fabric. Rather than squeezing in some additional inches I decided to stop. I did not want to be trying to create those final bands of supplementary-weft patterning while being very close to the end of the warp. There is a tendency to apply too much tension when there is little space left in which to work. That can cause elongated motifs and I really wanted the motifs at both ends to have the same proportions. That was a little hard to monitor with the other end of the fabric being rolled up and out of view. I love how, after washing and pressing, the supplementary-weft motifs sort of melt into the cloth. They lose the appearance of having been created with individual strands of silk and look more like they have been painted on the fabric. I pressed it while damp and, as the moisture slowly lifted from the cloth, I could feel the fabric softening, relaxing and loosening up…magic! I am really pleased with this project. The scarf feels wonderful. It’s funny thinking back to the start of this project. I kept trying to come up with ways to hide the yellow because I felt the color was too strong. I wanted to cover the scarf with cream supplementary weft and just let the yellow peak through in places. I am glad I didn’t go ahead with that plan. When I finished winding the warp, I was close to abandoning this project. I had come up with a weird improvised windy warping path so that I could get the 86” of length. It was not a path to which I was accustomed and I wandered off it at various times. So, there were lots of things to be fixed and adjusted once I had taken the warp off the stakes and that always spells trouble for me. I rolled the warp in paper and left it over night. I didn’t want to look at it anymore. I even considered undoing the whole thing…all 860 ends… and starting again but knew it would end up a mess. Somehow, things looked different in the morning. I made the adjustments, set up the warp and just started weaving. An online weaving friend commented that it is surely not cold enough in Santa Cruz Bolivia for me to need such a scarf and that I should send it to her in Canada. Well, she is right about that. It very rarely gets cold enough for scarves here. However, I have a dream of ending up back in Australia one of these years and living in a place called the Blue Mountains where I used to hike and climb a lot in my younger days. It is certainly cold enough there. I like to think of these things I am creating as items for a ”hope chest” for that dream to come true. Maybe I should start knitting socks too. I have always been envious of those. In the meantime, I travel a lot and this scarf will certainly be worn even if it is just draped over my shoulders for decoration. Now I can give my full attention to the wool warp. Let’s see how many more versions occur to me before I actually start warping and if I can have it set up and underway before the next blog post. 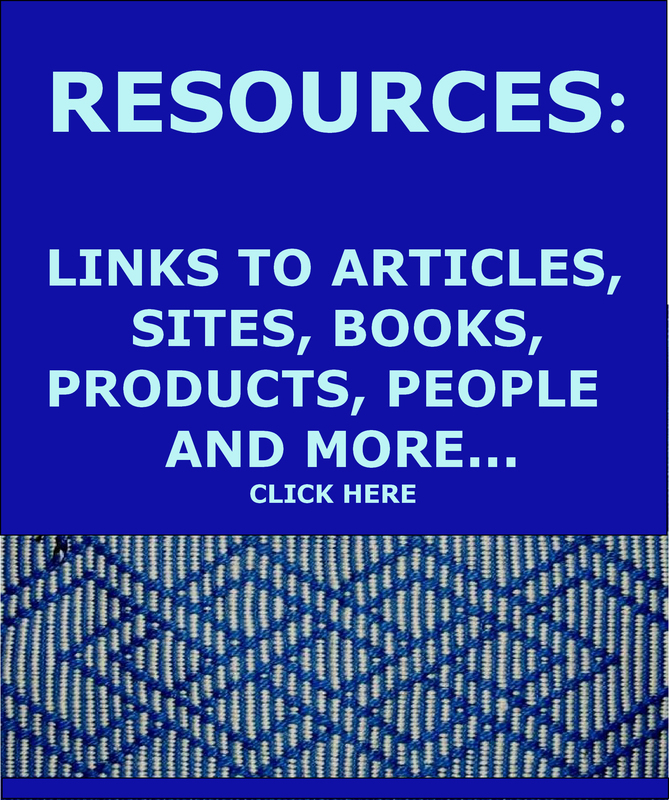 Until then…..
« Backstrap Weaving – Length! Your scarf is too beautiful to even find words for! Amazing weaving and talent! What a beautiful scarf. It’s hard to believe it is handwoven – I can’t imagine weaving something so fine. Thank you for links to Dorinda’s website. Coincidentally I am thinking about going to the Blue Mountains with my hiking group. I have always wanted to go there. I would also love to hike in Bolivia. I spent a week there in 2014 after travelling in Peru. One day! Thanks, Melanie. I know you will enjoy Dorinda’s website all the more for having been to Bolivia yourself. Hiking in the Blue Mountains…you will love it! your scarf is stunning and so elegant! Hello, does this mean you have items for sale? 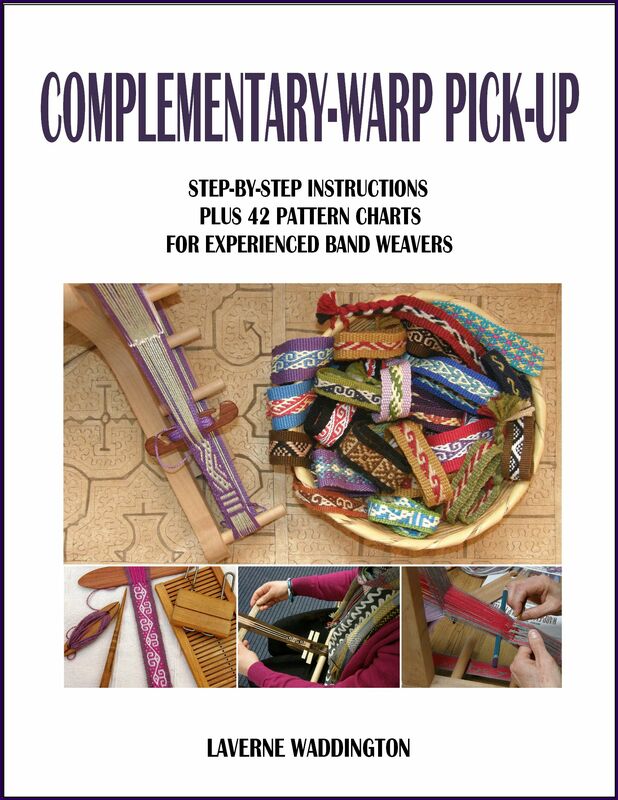 Thanks, New to blackstrap weaving, insomuch as I have not yet put the loom together!!! Hi Patricia. No, I don’t sell anything. 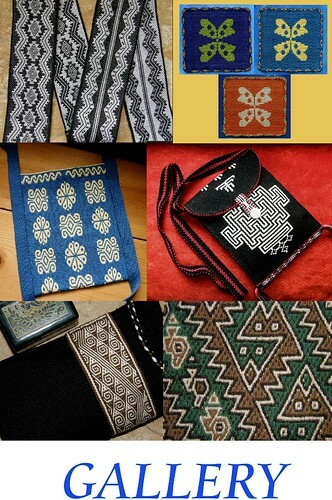 If you are interested in buying the weavings made by the ladies in Cochabamba, you can contact Dorinda via the PAZA Bolivia site. The link is in my post. Dorinda has much better internet access now and can get back to you quickly. She will be visiting the U.S in May and can bring orders with her, if that is where you live. Wonderful silk scarf, and helpful to know the story of getting discouraged and almost giving up. I have had that experience several times when weaving, and in the end loving the result. It’s lovely to hear from you, Mary. It’s almost 7 years since we first met online and I will always remember that as you were the one who told me about a magazine called WeaveZine and encouraged me to write an article for it. Wow! Just wow! Your scarf and your weaving is just beautiful! Thanks again for the inspiration! Perfection to my eyes! It really has quite a Japanese feel to it because the flowers look like the Japanese hemp leaf motif. I think you will have your dreams come true in the Blue Mts, just keep holding that dream in your heart. Thank you Kristin…sweet words 🙂 I must do a Google image search for the Japanese hemp leaf.